The below recipe is adapted from The Kitchn's Southern-Style Pickled Shrimp. That photo is much better than mine, but my shrimp still look pretty good. And taste it too. In a saucepan, combine the onions, lemon, cider vinegar, canola oil, capers, celery seeds, sugar, salt, and hot sauce. 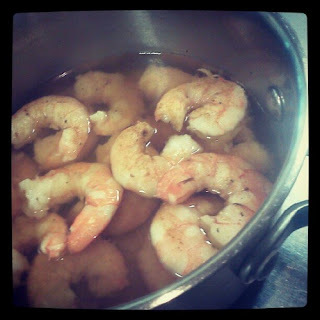 Simmer for 5 minutes, Add the shrimp and cook for 4-6 minutes. Cover and remove from heat. Cool down and refrigerate for a minimum of 24 hours, stirring occasionally. Serve chilled. Keeps for at least a week. NOTE: Sometimes I'll add whole lemon slices and extra capers that have been fried (they pop and bloom in hot oil--it's like magic) after the shrimp have cooked but before the mixture is cooled down. Leaving the tails on is a great idea for party appetizers. Just be sure to have receptacles available for the refuse.